You're never alone in the garden. a crumb for them to share. 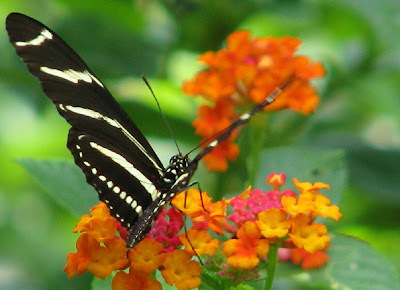 You do have so many visitors in your garden. The frog photo is so cute. 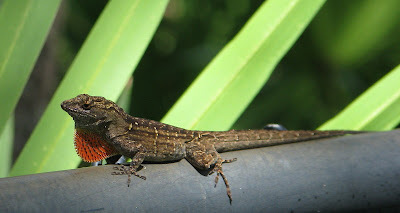 I love seeing lizards in the garden. We don't have lizards here. I have often wondered why?? Of course those lovely winged creatures can't be beat. Great captures of the 'Garden Company' just think how much company you don't see in the garden. 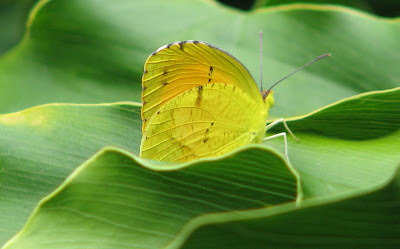 I have to go to a butterfly exhibit to see that many butterflies! What a variety you have there! I love strolling through the garden to see how many creatures I see! Love the poem and I love the pictures even more! 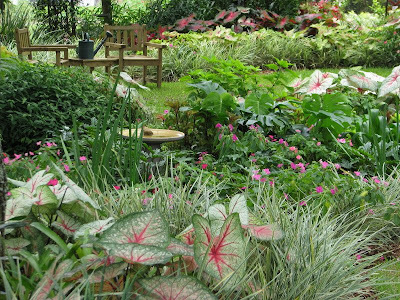 I am reading Cultivating Delight, A Natural History of My Garden by Diane Ackerman right now. Have you read it? It is wonderful! 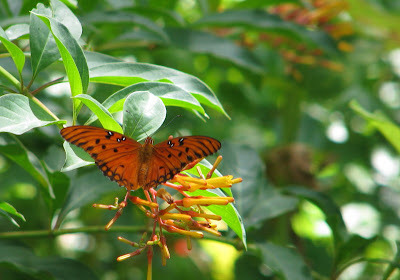 Wonderful butterfly photos! So you have Cuban Brown Lizards in the garden too. He is not native but a blast to watch. We have baby Five-lined Skinks all over the place here right now. Your piece of paradize is beautiful Meems! Fantastic photos! I love the tiny frog so much! Such a cute little thing. 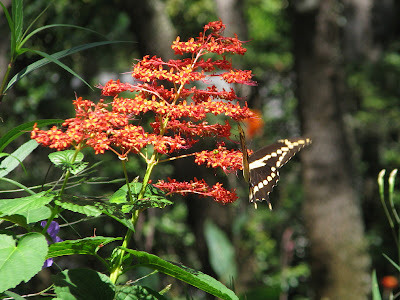 The butterflies are great and your flowers look like they are thriving and flourishing this summer. Hi Meems, We are home from Florida--and I kept thinking about you --when we went from Ormond Beach across the state toward Tallahasee. Where exactly do you live??? Someday--I hope we can visit you and see your beautiful garden/yard. Hope things are going great for you down there in HOT Florida. wow, what a collection of friends! Beautiful garden! I'm trying to get better with the non-veggie stuff. You're lucky to have such pretty visitors! I enjoyed your pictures as usual. I see some egg laying on your passion vine. 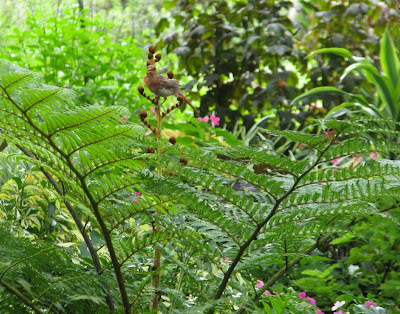 Do you have trouble keeping it where you put it in your garden? 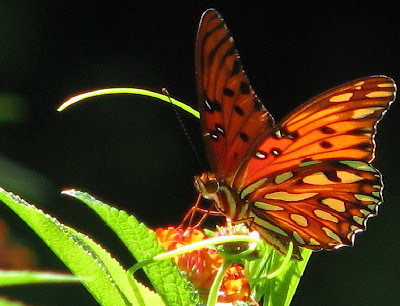 Those Gulf Fritillaries are out in great numbers this year... they are a favorite here, too. I wonder if the lizards don't overwinter??? Just a thought... I haven't done a shred of research on it. Thanks for coming by. Two! How fantastic. The way you describe seeing your hummers is the same way I've seen a few here this summer. They swoop and they drink and they move quickly. No photos yet. It seems this time of year the garden is teeming with critters in abundance... of every kind. Thanks so much for the recommendation... I haven't read it but will check it out right away. Sounds delightful. So that's what you call him? Thanks for the ID... there are a lot of them around here. Skinks? only occasionally will I see one or two. But I DO have snakes... came across two just yesterday. Thank you. The flowers in these photos are suited for our 100% humidity... as a matter of fact they thrive in it so that helps. I've been seeing so many young frogs lately... even young toads... I sure hope they are doing their duty of eating the slugs because I've got more than my share. I have a feeling you came very close to me if you went across the state from Ormond Beach. We are in the Tampa Bay Area. Glad you're back home safely. And I'm trying to get better at the veggie stuff. Honestly, they DO keep me company all day long as I mill about doing my gardening. They are delightful to have around. I have seena ton on Dragonflies, Lizards, and frogs. 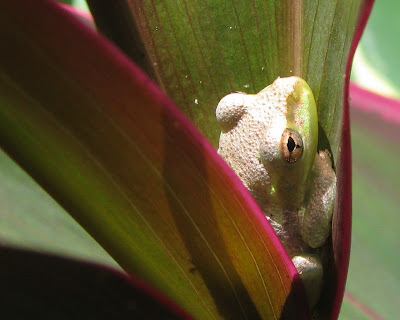 The frogs like to hide in the Banana Tree and Elephnat Ear leaves. 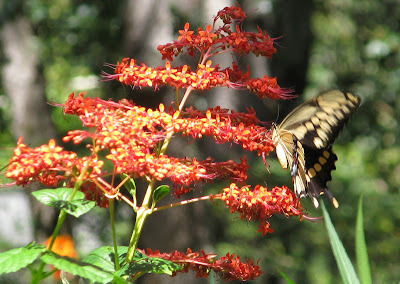 I also have Hummingbirds that loves the Penta's and Mexican Peunia's. The best way to keep the larva coming and aviod the consequences of the kudzu wannabe is to stick with the native corky stem passion vine. P. suberosa. You have to nurse this one along and find the right spot as it is not so vigorous, does not sucker and the larva eat it bare. It grows easily from seed which you can collect and share even from a potted plant. I also have had a less agressive vine I aquired 15 years ago and it is way less agressive. The flowers are smaller and it suckers just a bit and seeds are just frequent enough to keep it going without any care but not spread everywhere. When I find the name of this one I will pass it to you. I would not take a chance in keeping the invassive one you have as it will come up 50 feet from where you have it and you will never win the battle to erradicate it if you wait too long. Great information... thank YOU! I'm not sure how to tell which passiflora I have... the nursery did not have a thorough tag... just "passion vine". The flowers are definitely smaller though. I have a feeling you are right about the suckers ... I already see them coming up several feet away. This one is going to have to be replaced in the fall to avoid a long standing nightmare. omg, i thought for a moment that you had released another latent talent - writing poetry! but alas, i found the credit at the end of the post! great pics! You are so lucky to have such beautiful creatures visiting. Also to be able to garden all year would be great, although the winter break with snowy days is kind of nice. 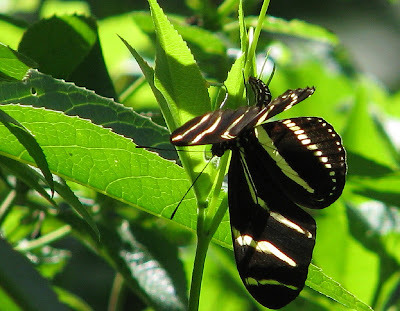 I love the pictures, especially the black and white butterfly. And of course like everyone else, that frog is toooo cute. such a peaceful post meems...i love it. 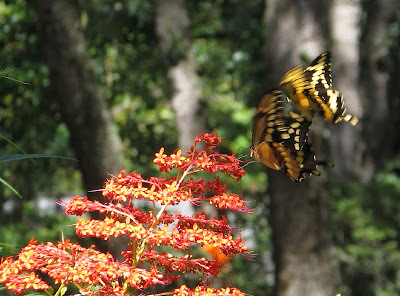 we have been deprived this year of many butterflies. there are some but just not as many as last year. i really am delighted you have so many. i love the frog peeking out. 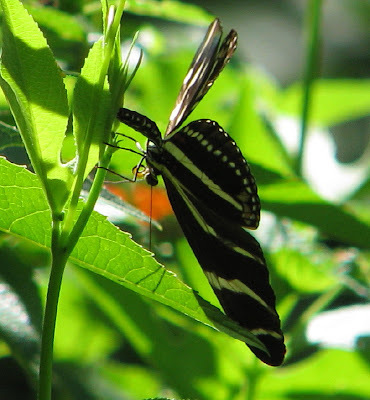 there are always so many creatures in the garden and you have captured the essence of them so well. your photographs are exquisite. Mercy, this is jes' so lovely, Meems. Whata summer you have had--I can smell that oak mulch. What gorgeous photos. It is always a treat to visit here.